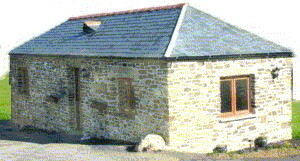 Set away from the campsite, this quaint little stable conversion has a lovely cosy feel about it. It has everything to make your holiday as relaxing as possible. With some lovely features including open beams and granite window seats to slate floors in the lounge/kitchen. The cottage has retained it's character and charm. With lovely views from the lounge it has a nice sense of peace. Outside provides seating area to the side of the cottage and across the way a lawned area with fantastic views down the coast to Pentire Head. We have the most spectacular sunsets which can be enjoyed from the lawn with a Barbecue or a glass of wine. There is under floor heating throughout. With wood-burner effect fire in the lounge/kitchen. Open plan living with kitchen and dining areas, TV, DVD, CD player etc. Electric Cooker, Fridge. Microwave. Wet room with shower, WC & basin, Zip and Links Beds in Bedroom can be made as a double or Twin. Travel Cot & High Chair. Inclusive. Electricity, o/f central under floor heating, Towels, Duvets. Garden Furniture, BBQ. Parking. Non Smoking. Self catering at Little Pennycrocker. The property has good level access, suitable for wheelchair users. with any questions about the holiday cottage.